Extreme STRENGTH, HEIGHT, POWER, PRECISION and CONTROL can now be Yours! Everything You Ever Wanted To Know About Kicking DVD's Series! Also, I used to have a slight pain in my quads every time I attempted a front split. Guess what? It's not there anymore; all the previous exercises you do before the split seem to have kind of fixed it or whatever. So, now you know, if you still have some problems with your hips or something similar keep on doing the conditioning exercises and the techniques explained. Never give up. CLICK HERE TO GET YOUR KICKING COMBO RIGHT NOW! If you are one of the people who haven't achieved the top of your kicking potential, you need to read this more than anyone else. My method is unique and very different from anything you have ever tried before. In this DVD series I'll take you through step by step instructions on how to get your kicks, higher, stronger, faster in a very easy to understand and safe approach. Each DVD is packed with information specific to each of the kicks discussed. In this series every Kick is explained and drills are placed in sections for a specific modality, to make it easy for you to maneuver, understand and follow.This series contains 3 DVD's (RoundHouse Kick, Side Kick & Hook Kick and Front Kick). Each DVD has 11 sections each and runs for approximately 2 hours each. Get this Special Combo Today and Save! You will also get a Bonus (Broad Spectrum Conditioning Video NOT available for Individual Sale) CLICK HERE TO GET YOUR KICKING COMBO RIGHT NOW! Let me tell you the real reason you still haven't reached the full potential of your training. Ready? Because you are training wrong! It's not your fault either. No one taught you how to train for kicking. And no, your master is not evil and holding back the knowledge that you pay him for. Most martial arts instructors simply don't know how to train their students when they hit a wall. Think about it; they copied their master, who copied his master and now you are expected to copy what you see as well without any explanation of how to do it. Few people get lucky and succeed without proper training, which is precisely the reason why such a small percentage of martial artists have well developed kicking techniques. Everything You Ever Wanted To Know About Side Kick & Hook Kick, Front Kick and RoundHouse Kick DVD Series! For a limited time only, if you order the whole set of these 3 DVD's, you will receive a $50.00 value Broad Spectrum Conditioning for Kicking DVD (exclusive to this package and not sold separately) Free of charge! And to top it all off you will also get FREE SHIPPING!!!!! To sum it up you will get a $90.00 value bundle (Book & DVD) FREE of charge, if you order the 3 DVD series today! It takes just one muscle group to be underdeveloped, for the kicking technique not to work. 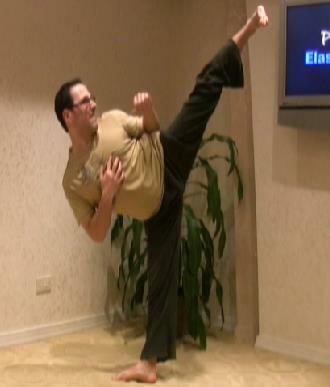 A basic front kick demonstrates this point well. For a successful kick strength is required in the anterior chain of the kicking leg. Flexibility and strength in the posterior chain of the kicking leg is needed for successful and safe height and the deceleration of the kick. That is just the kicking leg; the supporting leg and trunk have many requirements as well. If they are not there, the kick can't let you do the kick correctly, then what are you practicing? This DVD focuses on two basic, yet often misunderstood kicks. In this video Paul Zaichik shows you the most efficient drills needed to master every aspect of the side kick and hook kick. It doesn't have to take years to master a perfect kick, if you know what to practice. Indeed very few masters in the world, who perfected their own kicks, know how to quickly and safely pass the skills on to others. This DVD will fill the gap and help answer questions that you may have. Get This Combo Today! Save, Get 2 Free Bonuses and FREE SHIPPING!! !